Last time, we talked about a quick and easy way to get a memory dump on a Windows based PC. This time, we will cover pulling passwords out of captured memory files. 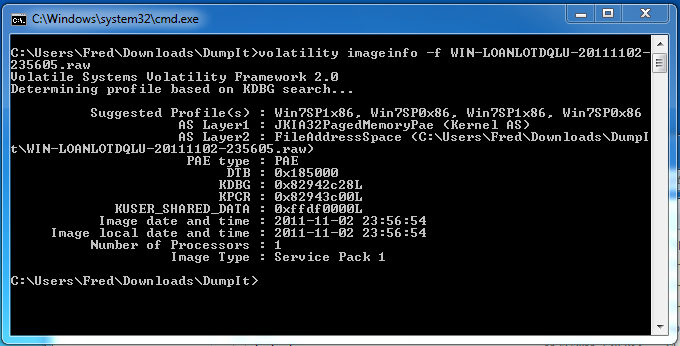 Several programs exist for memory analysis, we will be using “Volatility” from Volatile Systems. If you are performing your analysis on a Windows system I recommend downloading the stand alone .exe version. If you don’t then you will also need to install Python. 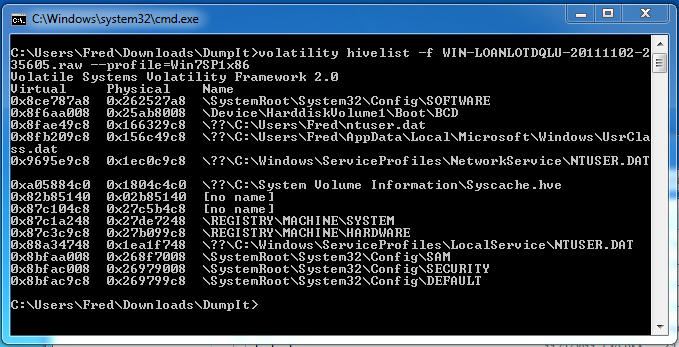 This command gives you several pieces of information, for now, we just need to know the profile type of the memory dump, in this case Win7SP1x86. We will use this in the next few steps. We now have a list of where several key items are located in the memory dump. 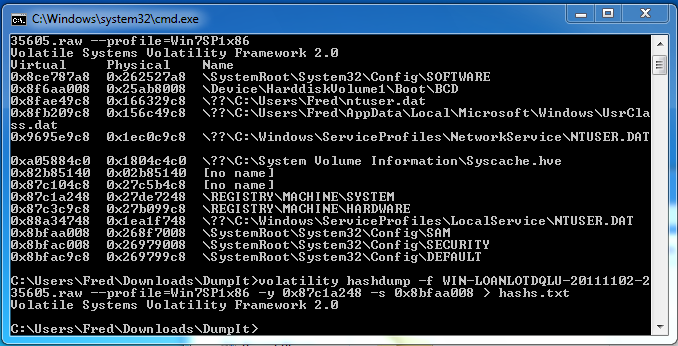 Next, we will extract the password hashes from the memory dump. To do this we need to know the starting memory locations for the system and sam keys. Now, if you are using Windows XP and have passwords shorter than 14 characters (LM passwords), you can run them through a password cracker like John the Ripper. Or better yet, you can copy the long alphanumeric string after the user id number (500 or 1000 numbers) and paste them in Objectif Sécurité’s Online XP Hash cracking program. This utility cracks most LM based password hashes in 5 seconds or less. For more information see Cracking 14 Character Complex Passwords in 5 Seconds. This will not work on Windows 7 passwords or XP passwords longer than 14 characters though. These hashes are stored in the more secure NTLM format and can take a lot longer to crack. One cool thing though is that you do not need to crack the NTLM hash to get access to a system. You can log into a system using the hash itself as the password! The password could be a simple 14 character password or a complex 32 character monster, it does not matter. You can still use the hash to get a command prompt. For more information see NTLM Passwords: Can’t Crack it? Just Pass it! This really goes to show that passwords really are not as safe as one might think. Dual or multiple authentication systems are really the way to go on secure systems. Well, that wraps up pulling passwords off of a memory dump, next we will learn how to view the active network connections and processes from a memory dump. Passwords: Are We Focused on the Right Issues?